Our new podcast logo – a one year anniversary celebration. 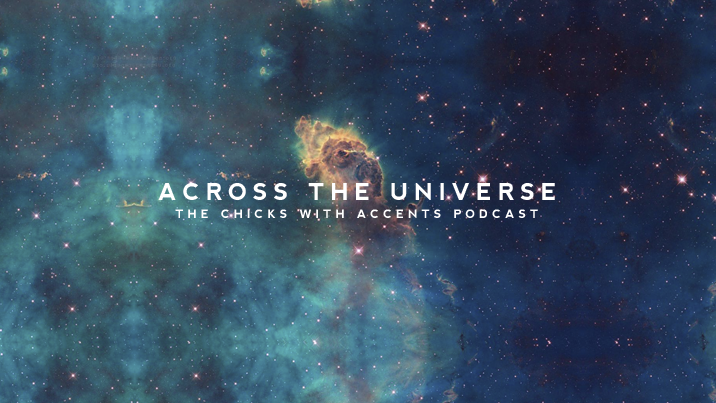 Exactly one year ago today, we Chicks with Accents published our very first podcast episode. Celebrating this milestone, we redesigned the podcast’s image and came up with new ways to spread our work and improve it, in order to serve you better. Here are some of the news. — You can now be updated on anything Across the Universe through our WordPress Blog. — From now on, all our episodes will be available for you to listen online or download, completely free. — New episodes will be structurally optimised, along with a few more surprises…! — The podcast now has a Youtube channel, where episode trailers will be uploaded. As always, we encourage your feedback, so leave us a comment below or get in touch through our facebook page. Happy anniversary! Such a nice milestone to cross, isn’t it?! yes, I can’t believe it’s been a year already! Congratulations on your anniversary! Here is to many more!! I’m WAY late, but happy belated anniversary! 😀 Keep up the great work!